Assistant Chief Henry Tavares, Robin Reed, Assistant Chief Marshall Kanehailua, Thomas Moyer, Chief Harry Kubojiri, Alison Taylor, Deputy Chief Paul Ferreira, Grant Tioganco and Assistant Chief Derek Pacheco. 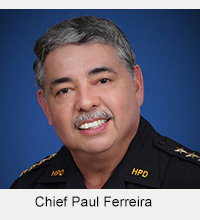 Four citizens were honored Tuesday for detaining an armed robber at a Hilo pharmacy in February. 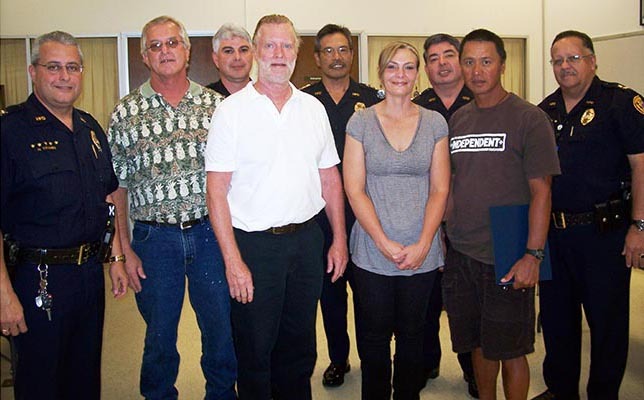 During a brief ceremony at the Hilo police station Tuesday morning (May 18), Chief Harry Kubojiri presented Certificates of Merit to Thomas Moyer, Robin Reed, Grant Tioganco and Alison Taylor for their “heroic and selfless” actions on February 23. Moyer and Taylor were working at Windward Pharmacy at Puainako Town Center when an armed man entered the premises and demanded drugs. The suspect pointed a rifle at Moyer and said he was going to shoot him. The intruder then struck Taylor’s back with his rifle and she fell forward at her desk. She immediately stood up, grabbed the barrel of the rifle and struggled with the suspect. The armed man pushed Taylor backward and regained control of the rifle. Moyer immediately grabbed the barrel of the rifle and struggled with the suspect. Taylor assisted by pulling the gunman’s hands off the rifle. Moyer gained control of the rifle and tossed it away. The suspect then ran toward the exit door. Reed, who was working at Puainako Town Center, observed the armed man inside the pharmacy and heard a scream. He immediately called 911. When he saw the suspect walking toward the exit door, he entered the pharmacy and knocked the man down, pinning him to the floor. 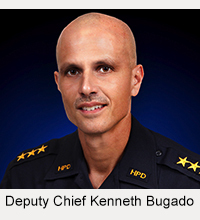 Tioganco, who also was working at Puainako Town Center, saw Reed and Moyer struggling with the suspect. He ran inside, grabbed onto the suspect’s legs and assisted Reed and Moyer with detaining the man until police arrived.